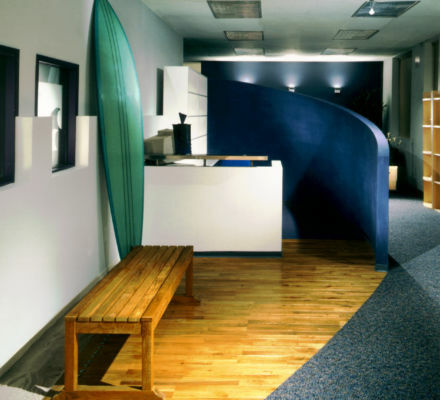 With the rapid growth rate experienced by the 23rd fastest growing company in Los Angeles, this firm retained J S D A to analyze its space utilization to accommodate a large number of new employees. 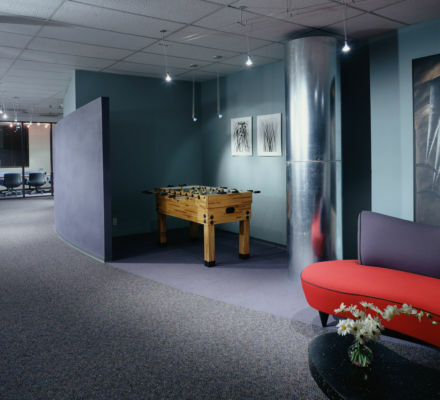 Utilizing a strategic planning methodology developed by J S D A, options were developed for consideration by the firm including on-site and off-site expansion space, home officing for writing staff, and hoteling for sales and marketing staff. This multi-media firm creates on-line education and training for Fortune 500 companies, which have large scale customer service departments dealing directly with customer relations. 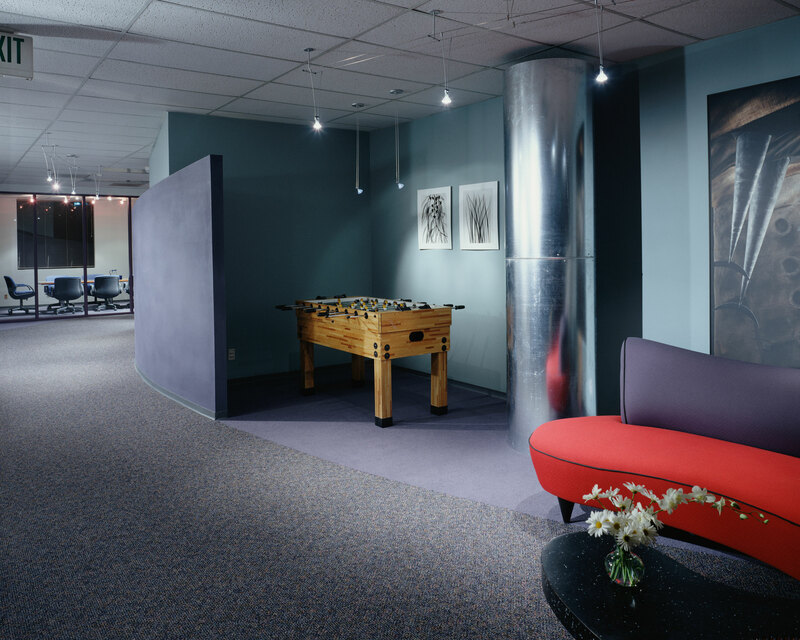 The alternative officing strategies are developed to decrease staff population at the original location, to share officing for particular departmental groups, reducing overall square footage and density, and expansion space to provide a creative environment for production staff, intermingled with business functions. The flat hierarchical chart gave rise to the executive placement in the center of the plan, capturing a feeling of open office throughout. 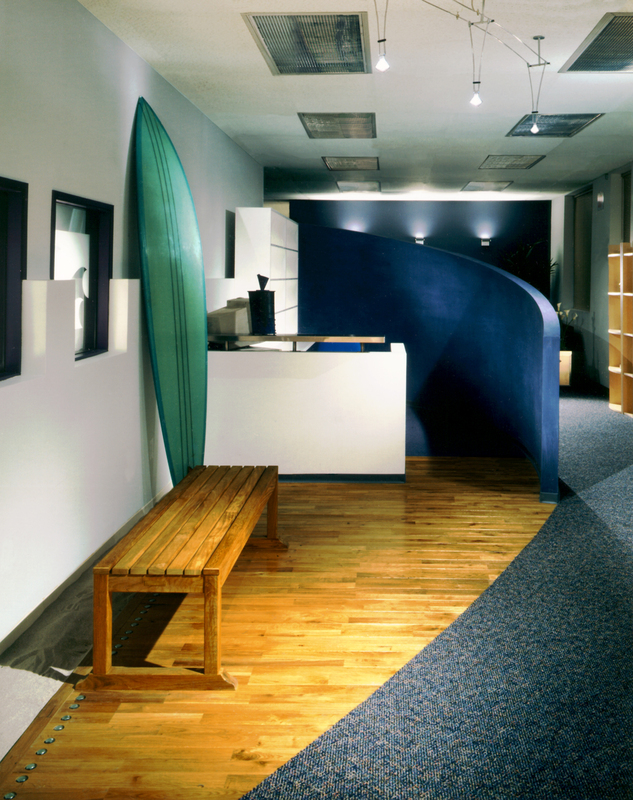 A number of small teaming spaces were introduced through open area conferencing tables for impromptu team meetings, informal soft seating lounge spaces, and larger conference rooms for client meetings. The larger conference rooms are well equipped with rolling audio visual systems and computer terminals displaying the firm’s completed compact disks. The concept centers on a voracity of energy created by the group, with contrasting shapes and forms relative to the differing disciplines of education and training, yet adhering to a sense of continuity throughout the entire space. The connectivity between existing space and expansion is highlighted through the use of a 45-degree angle on which the plan is oriented. Customary Steelcase 9000 workstations provide acoustical support for traditional business functions, while the graphics, writers and production staff is experimenting with furniture for “what’s next”, with modular wheeled workstations based on two computer monitors each. The random, organic space patterning provides the interactive environment requested by the users. The project was completed within two months allowing for occupancy throughout construction. This speed of delivery increased the client production approximately 25%, gaining business sales totaling more than $100,000 during the project timeframe.